The IPC wrote a blog several months ago on the potential dangers of button batteries during the past holiday season. 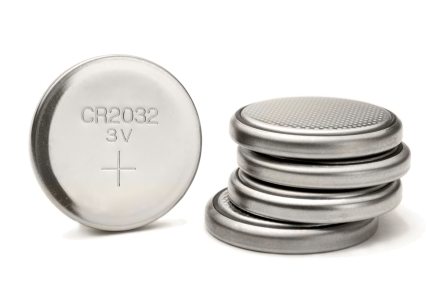 As an update, a new study recently published in Pediatrics, shows that ER visits related to batteries have doubled in the past 20 years; most of the increase has occurred in the past 8 years as button batteries have become more ubiquitous in the marketplace. According to the study, button batteries accounted for 84% of the battery-related ER visits. Children under the age of six were involved in ~75% of ER visits and children between the ages of 1 and 2 years old were the most frequent ER patients overall. Interestingly, the sources of the batteries were not toys, but instead common household items used mostly by older children and adults. The danger of button batteries is that in some cases (especially in small children) they can lodge in the esophagus. The constant current the batteries release can cause an esophageal burn in just a few hours. 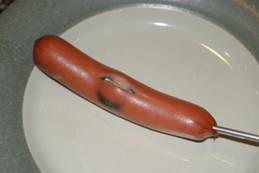 Dr. Brent Furbee, medical director of the Indiana Poison Center, shared the results of an experiment of the burns a button battery can make in a hot dog. The darkening was noted in less than one hour and this burn was made in less than three hours. Interestingly, the thermometer probe (seen in the second photo) did not register an increase in temperature and the burn may have been caused by the constant low level electrical current emitted by the battery. 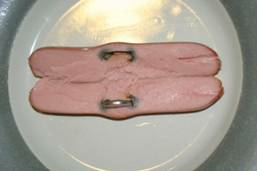 I think it is fair to say the damage to living tissue could be much worse than the damage to a dense, pulverized, cured meat product, but the visual of a burned hot dog is worth a thousand words. In cases of poisoning and button batteries, prevention is worth much more than a pound of cure. Don’t forget to check out the “My Child Ate…” resource center which gives toxicity level and treatment information for the most common substances/products ingested by children. Oh, What A Year It’s Been!